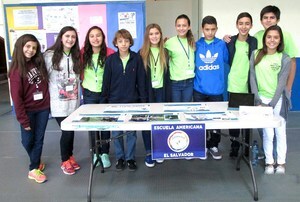 At Escuela Americana students have various opportunities to travel to other countries in Central America (AASCA Schools) and the United States. These opportunities play an important role of experiential education and to learn outside of the traditional classroom setting. Middle School Mathcounts team participates in the State round that is held yearly in Mexico. The AASCA Middle School Leadership Conference is held yearly at an AASCA participating school. This Conference was an initiative of Escuela Americana and is now an official AASCA event. The AASCA Middle School Leadership Conference is designed to foster and strengthen leadership skills in young leaders. It aims to promote understanding, respect, and effective communication with other leaders and their peers and to empower participants to become a positive influence on their school’s culture. The purpose of the Leadership Experience program is to provide opportunities to learn and get acquainted with various international leadership organizations and structures, US traditions, history, and governmental institutions. The program also enables students to become familiar with higher education opportunities and requirements as well as cultural events. Students travel to Washington DC to learn firsthand about the U.S. government, politics, history, traditions, and many leadership skills. They visit the Capitol; have the opportunity to perform the Laying of the Wreath at the Tomb of the Unknown Soldier at the Arlington National Cemetery. Ivy League Model United Nations, also known as ILMUN or MUN, is an educational simulation and/or academic competition in which Escuela Americana students learn about diplomacy, international relations, and the United Nations. Student delegates who participate in Model UN conferences are placed in committees and assigned countries, or occasionally other organizations or political figures, where they represent members of that body. Delegates conduct research before conferences and formulate positions that they will then debate with their fellow delegates in the committee, staying true to the actual position of the member they represent. At the end of a conference, the best-performing delegates in each committee, as well as delegations, are sometimes recognized with awards.